GULFPORT — The battered prosthetic foot barely resembles the one Mary Burkett left Shriners Childrens Hospital in Tampa with six months ago. The heavy-duty grade plastic is pockmarked with dents. Toes are missing, broken off from the repeated pounding. Once, when the doctors cut the prosthetic open, sand poured out. “I like playing sports a lot,” Burkett grins. That phrase feels foreign to Burkett, a starting second baseman on the Boca Ciega High School softball team. Burkett was born without her right foot. Doctors have never been able to fully explain why. It could have become entangled around the umbilical cord. There are bumps that show where her toes started to grow, but otherwise her right leg ends at her ankle. Growing up, Burkett’s father, Jake, would watch her along with older brother Josh and younger sister Lauren during the day before heading off to night classes at USF. Visiting the park was a daily ritual. The siblings would go head to head, no matter the sport. Josh, two years older, never let up on his sister. Mary fought right back, at the encouragement of their father. Burkett continued pursuing athletics. 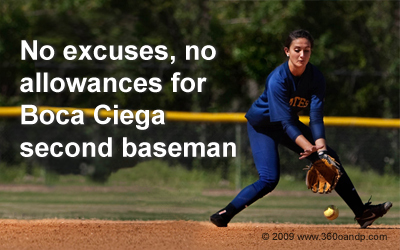 She made the Boca Ciega volleyball and soccer teams as a freshman. This year, she reached double figures for goals from her left forward position in soccer. “I’m probably the best at soccer,” she admits. She would play basketball for the Pirates but it interferes with soccer season. She plays flag football in a rec league near her home. She wakeboards. Gymnastics was Burkett’s main sport until doctors told her the constant pounding on the small surface area of her right leg could give her knee and hip problems down the road. In preseason practice, Boca Ciega softball coach Michelle Beckert encouraged Burkett to play the year without her prosthetic foot, which would often leave Burkett’s leg raw and blistered. Her batting was compromised because the prosthetic wouldn’t turn with the rest of her body, reducing her power. Initially, Burkett balked. Taking the field without the foot would leave her vulnerable. She already heard whispers, felt the stares. What would people say now? Since then, her confidence has soared. “I’m really proud of the courage she showed to take it off and come out on the field and face her insecurities about her foot,” Beckert said. And she has become even more effective as a player. Beckert says she is the team’s second-fastest runner. Her focus in the field is unwavering. Burkett will join her brother next year at Florida State, where she plans to pursue a career in the medical field, a path fostered by the medical magnet program at Boca Ciega. Burkett will never let her absent foot dictate her path. That phrase isn’t even in Mary Burkett’s vocabulary.